Camping is an alternative way of spending your holidays, which wins more and more fans in our country. For some, it is a matter of lifestyle, while, for others it is an excellent choice for low budget vacations. What is certain though is that camping promises a unique experience of relaxing and carefree holidays! So, if you love exploring, if you are looking for contact with nature in its purest form and you want to experience the unique feeling of freedom which this type of holiday has to offer, then it is worth leaving your hotel room and give it a try; pack your tent and inflatable mattress and get ready! 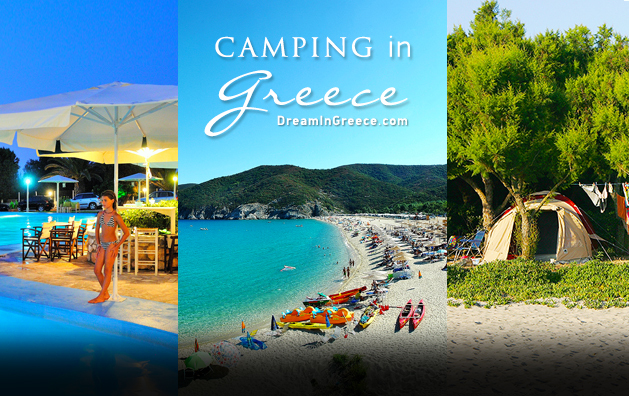 Throughout Greece, you will find numerous camping facilities, so well organized that even hotels would envy them! Pools, playgrounds, open-air cinemas, water sports, tennis and beach volley courts, as well as beach bars, are just some of the amenities provided by Greek camping enterprises. DreamInGreece.com proposes two majestic destinations, ideal for organized camping: Halkidiki and the Peloponnese. In the wooded areas of Halkidiki, at the cosmopolitan peninsula of Kassandra as well as the idyllic Sithonia peninsula, you will find several options for organized camping. Among them, the modern Thalatta Kalamitsi Village Camp stands out. It unfolds in a dreamlike area of ​​Sithonia; the endless beach with the golden sand and the turquoise waters, combined with the dazzling green of nature, create an earthly paradise! Thalatta Kalamitsi Village Camp offers all comforts to its visitors. There, you also have the option to stay in a tent, a mobile home, a caravan or a wooden mobile home. If you are an athletic type of person who wants to combine relaxing holidays with activities, you can use camp’s sports facilities and play tennis, football, basketball, beach volley, or go to the gym, jog or cycle in the green fields of the peninsula, or even indulge in diving trips in Sithonia crystal waters. Another ideal destination for campers is the Peloponnese. In Messinia prefecture, you will find many paradise camping facilities which unfold in front of beautiful beaches. Excellent choice is Camping Proti, located on the southwestern tip of Messinia, offering breathtaking views over the deep blue sea as well as the small island of Proti. Seize the opportunity to tour the region, visit dreamy places like Koroni, Methoni, Pylos and Mani, and also spend some time at amazing beaches such as Voidokilia. Alternatively, you can stay at Palouki camping in Amaliada, unfolding alongside an extensive sandy beach, offering all amenities to its visitors. If you love sports, in Palouki, you will be able to attend yoga sessions, go cycling, and play volleyball or table tennis. Palouki camping can be the base for excursions to many beautiful nearby areas, including, Ancient Olympia, Ancient Elis (Ilida), Kyllini baths, Caiaphas’ lake and Neda gorge. Greek Easter 2016 - Which are the Top destinations?